The Wavewalk 700 is a larger, wider version of their Wavewalk 500 series. It is 12'10” in length and 31” wide, but weighs only 20 lbs more than the 500 series. The biggest difference is in the payload size, which is 550 lbs compared to the 360 of the 500 series. According to Wavewalk, the 500 kayak series is one of the most stable kayaks in the world and the W700 is even more stable. 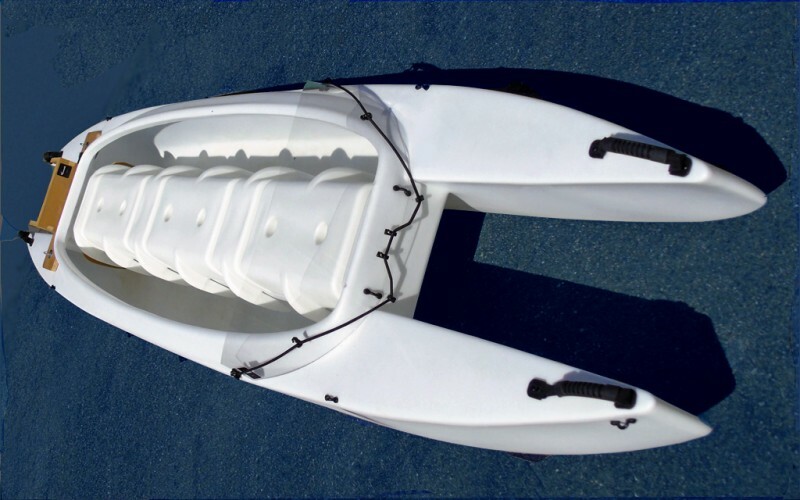 This is great for beginner kayak anglers who struggle with maintaining their balance as the W700 provides the same stability as you’ll find on a regular fishing boat. The size of the W700 means it can comfortably seat two adult anglers and have enough space left over to add an outboard motor. Foregoing the motor for paddles means that up to three average sized adults can fit on the boat along with their fishing gear. While the motor mounts and mounting plates are included with the W700, they are not installed. However, the installation process is relatively straightforward and easy to accomplish. The W700 is also a bit faster when paddling compared to the 500 series. The biggest concern with the W700 is the price tag. At more than $2000, it is a bit more expensive than what most people are willing to put down on a fishing vessel. There is no doubt that you are getting value for your money as the stability of the W700 is downright impressive, as is its spaciousness, but there are other kayaks that are available for much cheaper. The design of the W700 is also a bit more unorthodox compared to more traditional fishing kayaks, which might deter some anglers from investing. If stability and space are your biggest concerns and money isn’t an issue then the W700 is worth a closer look, but if budget is an issue, then you might want to look elsewhere.